The terror organization Hezbollah has built tunnels from Lebanese territory into northern Israel; the intention was infiltration. It turns out, however, that Israel Defense Forces' intelligence had been tracking them and last week entered southern Lebanon to destroy them. The Israeli operation--"Operation Northern Shield"--will likely not cause a major cross-border war because Iranian is not prepared to lose the assets it put there to the Israel Air Force. What appears less understood is how the United States--by its financial and training support of the government of Lebanon and the Lebanese Armed Forces (LAF)--is providing resources that allow Hezbollah to pursue its deadly machinations on the border. Not deliberately, of course, and not directly. The Trump administration strongly supported Israel's decision to strike Hezbollah. Even the Russian Foreign Ministry spokesperson said in a press briefing, "We do not question Israel's right to ensure its national security, including by preventing anyone from entering the country." Where this become hazy is when both the United States and Russia--and the permanent members of the U.N. Security Council--try to make a distinction between Hezbollah the terror organization and Hezbollah the government of Lebanon. establishment between the (U.N. demarcated) Blue Line and the Litani River an area free of any armed personnel, assets and weapons other than those of the Government of Lebanon and of UNIFIL deployed in this area; disarmament of all armed groups in Lebanon, so that ... there will be no weapons or authority in Lebanon other than that of the Lebanese State. Hezbollah's 100,000-plus rockets and missiles in southern Lebanon would make a mockery of the resolution, except that the "Lebanese State" separate from Hezbollah is a fiction. If Lebanon was a person, it would be diagnosed with multiple personality disorder; Christian, Shi'ite Muslim, Sunni Muslim, Druze areas and varying militias with different goals and alliances. But Lebanon is a sort-of-functional parliamentary democracy, which means, for purposes of discussion, the government is responsible for what happens within its borders. Today, the government is led by Hezbollah. In the parliament, Hezbollah and the Shi'ite parties aligned with it hold more than half the seats--and the Christian party of Lebanon's President Michel Aoun is aligned with Hezbollah as well. There is no separation between the "Lebanese State" and Hezbollah. Between the whiny little country that bemoans it inability to control events within its borders and the nasty little country from which Hezbollah terrorists massacre Syrian civilians, carry out terror attacks in Bulgaria and elsewhere in Europe, launder drug money in South America, train Hamas terrorists and return home with impunity. Between the country that begs for American aid and the country that begs for Iranian aid to carry out different parts of its agenda. The United States has, for more than a decade, been responsive to the face Lebanon shows it--unaware, unconcerned or unwilling to deal with the other face. 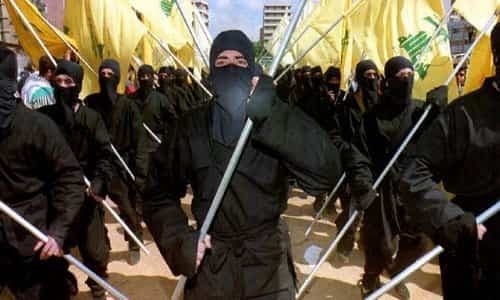 The U.S. government has provided military training and weapons--plus $1.5 billion in aid--to the government of Lebanon since 2006, the end of the war Hezbollah instigated against Israel. The goal was to encourage Beirut to abide by the terms of U.N. Security Council Resolution 1701, and to allow the LAF to operate in the south and on the border with Israel as a closer-to-neutral force. The United States remains committed to supporting Lebanon's sovereignty, stability, security, and its state institutions, to include the Lebanese Armed Forces (LAF) as the professional, multi-confessional and sole legitimate armed forces of the Lebanese state. She noted that the United States considers the LAF "the sole legitimate defender of Lebanon's sovereignty." But in the 12 years since the 2006 war, UNIFIL and the LAF have failed to establish or defend Lebanese sovereignty separate from Hezbollah. The United States pays for the fiction that the Hezbollah government in Beirut will order the LAF to fight the Hezbollah army in the south. That the Lebanese right hand will chop off the Lebanese left hand. Israel has no territorial aspirations in Lebanon. But the administration's current policy helps Hezbollah threaten it in a way that can easily lead to more, and bigger, wars.